So to compress with Xpress Huffman supply either 260 or 0x104. 1. 16-bit stub with code to unpack, evaluate and execute the compressed part. About 2x KB. 3. A tiny 8192 byte PE image, with unknown function. It's content is not evaluated. 2. Change code in bootmgr.exe to deactivate the check. Furthermore, to deactivate the signature check of winload.exe we need to change a few more bytes. Thanks Joakim! This is a great post. Thanks for finding the tiny portion with the information about the size and offset of the compressed part as I was having trouble finding it (it was much easier before). No precompiled binaries yet, but coming soon! Otherwise you could compile it yourself - it creates a DLL for now. It all should work, but please tell me of problems. I will be updating it in the next few days with license information (probably GPL). As you can tell from this, the uncompressed size is actually determinable just from the compressed data! However it is better to use it if available since it would be faster to not have to scan through the entire compressed data stream. LZX: This is currently just the 7zip code with some minor tweaks. Untested against RTL. As you can see, XPRESS is what needs my attention first, although it isn't as bad as it was originally: at one point my compression code was about 0.01x the speed of RTL! That's great Jeff! Thanks for sharing. Will try it out. any ideas as to what the mystery PE is for? As noted in the first post, it is not evaluated and hence not used for anything. 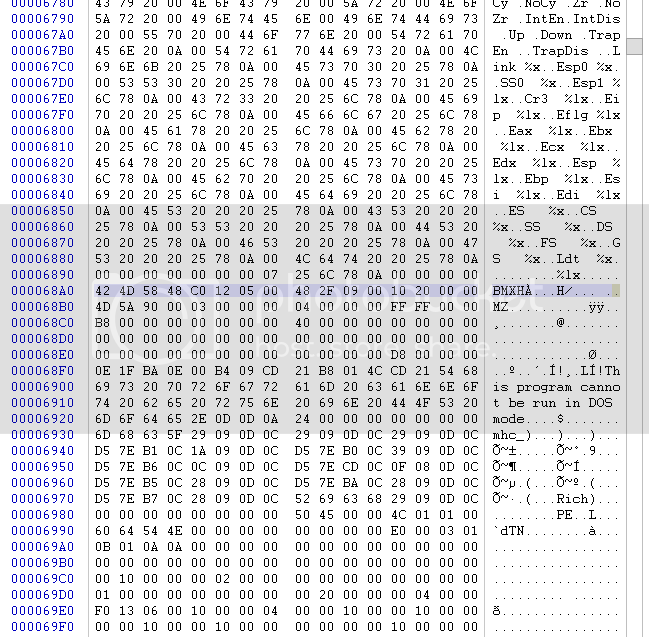 You can easily verify that by zeroing out all bytes for that tiny PE. If it is the same as Windows 7 bootmgr tiny PE then that PE file seems to be only for version information. It contains no code and one resource: version information. The Windows 7 one was a bit strangely setup (didn't have the language and name tiers of resource information) but it was obvious that the PE file was only for versioning information, presumably so you could get it without decompressing the actual PE so updatin would be easier. After some silly mistakes I got it working. Only tried xpress_huff_compress, and although it compressed, I did not manage to do it properly. How do you get "size_t out_len" ? I thought it was supposed to be calculated, but apparently not.. So I end up with a file with the compressed chunk, and depending on the size I manually put on it, the rest is filled with zeros. Another thing, compared to MS' implementation, yours seem to compress better. Have you tested compatibility with bootmgr's stub? Btw, bootmgr stub is not happy with the compressed exe. I haven't completely finished testing but I have been checking that a compress/decompress cycle results in no changes to the bytes, including for the bootmgr data. The out_len is simply the length of the given out buffer so that the program does not overrun the buffer. The return value is actually how many bytes were written to the out buffer. So it just needs to be large enough. For other types I have added a function for getting the max compressed size (if you gave the program completely uncrompressible data) but I haven't made one for Xpress Huff yet. There still may be bugs in the compression. Let me check. I included both 32-bit and 64-bit compiled dlls along with the license . It is written in AutoIt, which many of the members here use, including myself. Only tested and verified working Windows 7 x64. This means we can modify Windows 8 bootmgr from within Windows 7 (for example). Actually you can copy ntdll.dll from Windows 8 into Windows 7, and call RtlCompressBuffer on the copied dll. That way you can use MS native Xpress and XpressHuff implementation i Windows 7 too. Useful for this topic, since the XpressHuff compression implementation of Jeff's library currently is slightly incompatible with bootmgr 8's stub (ie execution breaks at the integrity checking part). Do you know the details of the difference? I thought it was working? I don't know the problems I guess. I will look into it in the coming week. Just to make sure, you are updating the compressed length in the data right (like after the BM thingee)? I created an application to recompile bootmgr.exe into bootmgr; http://www.mediafire...cz9ncm1cvm9eeri Should be compatible with any version of bootmgr, and also corrects its checksum. It works great on Windows 7 x64. It seems that your library is not happy on XP 32-bit. Is it even supposed to be? Your original values did seem a little off... Now they are nicely multiples of 4! Which program is not working with Windows XP? The compression library should run in anything, it only uses the standard C/C++ library. I believe you can even compile it on Linux and have it work, one I the major reasons I wanted to have so many different methods implemented in an open source way. However it is possible that the C/C++ library linked to is not compatible/present in Windows 7. Did you compile using Visual Studio or MinGW? If you used Visual Studio it may have linked to VC 2010 library, which comes with Windows 7 and nothing earlier. You can download it from Microsoft. If you used MinGW it may link to specific Windows 7 kernel functions. The solution is to compile on Windows XP. If you are having a problem with bmzip, I thin I did some weird things there. I recommend just not using it and using the compression library which does most of the work of bmzip and is actually now faster. Maybe I'm doing something wrong, but in MinGW it fails to compile. If built from VS2010 on XP x86, the program using the library will crash. Hmm, maybe it's something with the datatypes or whatever in the program using the library that is the issue on x86 platforms.. In the meantime, on x86, copy the 32-bit version of ntdll.dll from Windows 8, to your 32-bit Windows version and use my tool there. That works, verified on XP. Remember to keep the dlls in the same directory as the tool. It supports both LZNT1 and XpressHuff generated bootmgr's, and the tool can be run on any Windows version from XP and later. Read the readme about the required libraries though. MSCompression.dll is included in the download. So in short you can generate bootmgr of Vista with XpressHuff or Windows 8 version with LZNT1, or any combination you can think of Nice to have, sometimes. Just included it in the download section too. So, how to decompress the Windows 8 bootmgr into bootmgr.exe? I haven't found anything explaining how to actually do that. Edited by city24, 16 September 2012 - 09:35 AM. The easiest is probably to use Jeff's bmzip; https://github.com/coderforlife/bmzip However you could also use my frontend mscompression that uses Jeff's library, but that would require to extract the correct bytes before decompression. I guess I could have made something similar, by using the later Windows 8 ntdll.dll, but not now as there exist several ways already. Good. Let me know if you run into problems modifying it. Apologies for dragging this thread up but i'm at my wits end. Has anyone got a pre-compiled version of BMZip they can upload? I am having serious problems getting it to compile.